The first thing I did, when presented with the new Macbook Pro, was reach for that dimly lit display just above the keyboard. The new Touch Bar is the most exciting part of the new MacBook Pro. It’s a Retina strip that sits on top of the keyboard (Retina commonly denotes a super high DPI) and is a replacement for the function keys that have existed on laptops for what feels like forever. 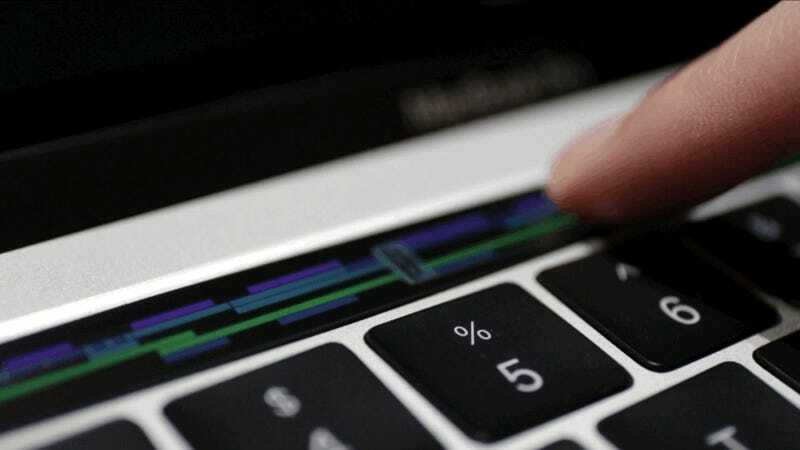 In typical Apple fashion, the company is touting this as a “revolutionary way to use your Mac.” Revolutionary is a bold claim, but after spending some time with the Touch Bar on the MacBook Pro, I have to admit, it is very, very cool. First lets talk about how it feels. I was sort of expecting the Touch Bar to feel slick like an iPhone screen, but it doesn’t, it feels matte, with a similar texture to the key caps on your standard MacBook keyboard. At the right of the Touch Bar are near-persistent icons for controlling stuff like screen brightness, volume, and Siri. You can customize these options if you want to have a different hot key always displayed, which will be convenient for tinkerers. Hitting the function key on your keyboard will bring up the standard function keys and access to stuff like Spaces and Launchpad—if you really want it. So don’t worry F1 fanatics, those keys are still available by pressing a physical key. What appears on the Touch Bar depends on what app you are using and the context in which you are using an app. For example, in Mail, when you’ve selected a message, there is an icon for “Reply.” Pressing and holding that icon will open up options to reply, reply all, or forward the message. There is also a compose icon, for quick access to creating an email. Once you’re actually composing the message, the options change again, this time showing off formatting options. Easy emoji access is rad. You can also see here how the texture of the Touch Bar is identical to that of the keyboard. In some apps, like Final Cut Pro X or iMovie, you can actually scrub through your video timeline. The result is super cool, but we’ll have to wait until a we’ve had more time with it to see if it’s actually useful. You’ll see similarly customize options for supported apps. Right now, most built-in Apple apps support the Touch Bar. Apps that are built supporting Apple’s default text tools (bold, italics, etc) will show formatting options, which means a ton of apps will support at least some features out of the box, but it will be up to developers to build support for Touch Bar into their products. 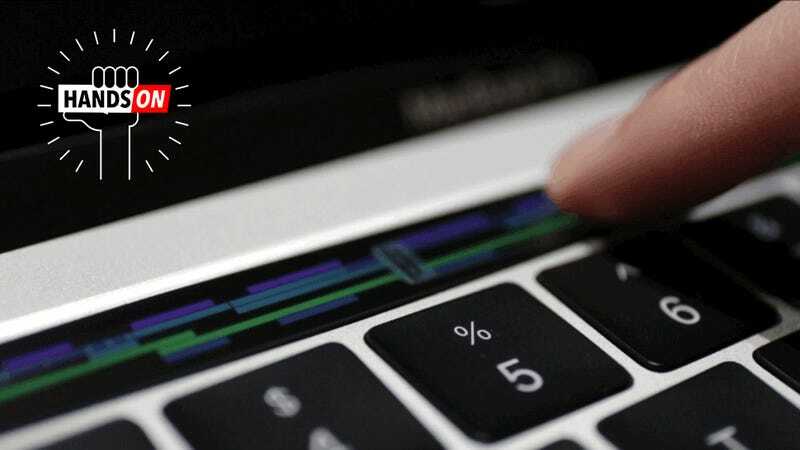 The Touch Bar is touch sensitive and supports multi-touch as well as gestures. It does not, however, use any sort of haptic feedback, which is an interesting omission. As a result, tapping on an icon on the Touch Bar can feel strange because there is no feedback that you’ve actually pressed a button. I can see some users who have muscle-memory for specific key combos having a hard time coping. I was worried that it would feel weird to look down at the Touch Pad, as if you couldn’t focus on the screen while also seeing what you are pressing. In my limited testing time, I have to say that fear was for naught. Glancing down and tapping and swiping through options felt surprisingly natural. Both the 13-inch and 15-inch models are stunning beyond the Touch Bar. These are incredibly thin laptops—the 13-inch is actually thinner than a MacBook Air, and even the 15-inch can be carried around easily with one hand. Yet the lack of tapering makes it feel more robust and substantial. The keyboard looks identical to that on the updated MacBook and the key travel is technically the same, but Apple has changed the butterfly switch mechanism on the Macbook Pro so it actually felt better. Something else that’s changed is the touchpad. The new Force Touch trackpad is huge. Like ginormously huge. Don’t believe me? I could fit my entire hand on the 15-inch trackpad! When it comes to extensibility, Apple has dropped the MagSafe, HDMI, Display Port, SD card slot, and full-size USB ports in exchange for Thunderbolt 3 backed USB-C ports. The more expensive MacBook Pro models have four ports each, while the lower end (Touch Bar-less) 13-inch MacBook Pro has two ports. This will mean dongle-hell for users in the short-term, but I firmly believe USB-C is the future. So get to investing now. Yet the real story behind the MacBook Pro is the Touch Bar. That’s the marquee feature. And honestly, from my limited experience, it’s cool as hell. Expect a more in depth dive when we get our hands on one when it launches in two weeks.